It is important for all of us, who are called to the dance ministry, to have a greater understanding of and a firm Biblical foundation for what we are doing when we dance before the Lord. However, anyone who has an interest or curiosity about movement ministry, would benefit from this valuable resource! 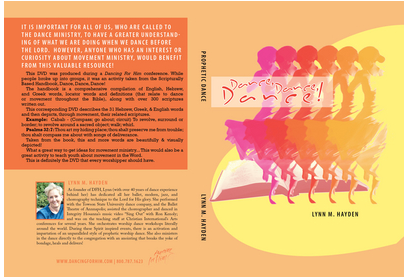 This DVD was produced during a Dancing For Him conference. After Lynn divided people up into groups, she taught them an activity taken from the Scripturally Based book, Dance, Dance, Dance! The book is a comprehensive compilation of English, Hebrew, and Greek words, locator words and definitions (that relate to dance or movement throughout the Bible), along with over 300 scriptures written out. This corresponding DVD describes the many Hebrew, Greek, & English words and then depicts, through movement, their related scriptures. Taken from the book, many scriptures are beautifully & visually depicted! This would also be a great activity to teach a scriptural foundation for movement. Use the ideas and then create your own! This is definitely the DVD that every worshipper should have!